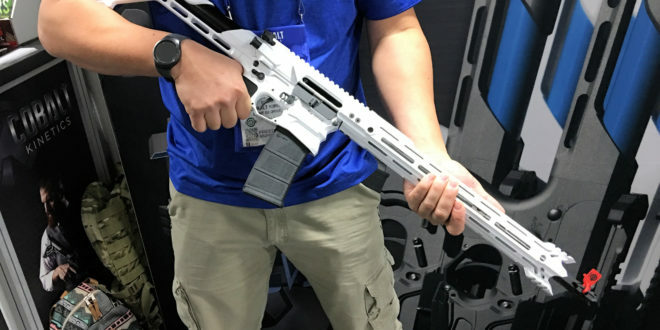 Cobalt Kinetics BAMF (Billet Aluminum Modern Firearm) EDGE 3-Gun Competition/Tactical AR-15 Rifle/Carbine with Patented DUAL DROP Ambidextrous (Ambi) Forward-Assist Bolt-Release Mechanism Gets CARS (Cobalt Advantage Reload System) as an Option! (Video!) | DefenseReview.com (DR): An online tactical technology and military defense technology magazine with particular focus on the latest and greatest tactical firearms news (tactical gun news), tactical gear news and tactical shooting news. When it comes to Cobalt Kinetics AR (AR-15) rifle/carbines, DefenseReview (DR) has admittedly been a bit preoccupied with their Evolve model competition/tactical AR (AR-15), due to it featuring the very interesting and advantageous Cobalt Advantage Reload System (CARS), so we’ve neglected the Cobalt Kinetics Billet Aluminum Modern Firearm (BAMF) competition/tactical AR, which sports its own interesting novel feature, an ambi (ambidextrous) forward-assist bolt-release mechansim called DUAL DROP that’s very fast and ergonomic to operate, particularly for lefties (left-handed shooters), since they no longer have to worry about tilting the gun and hitting the “ping-pong paddle” bolt release button/lever on the left side of the rifle. It deserved more attention than we gave it (which was zero), so we’re covering it now. Mea culpa. 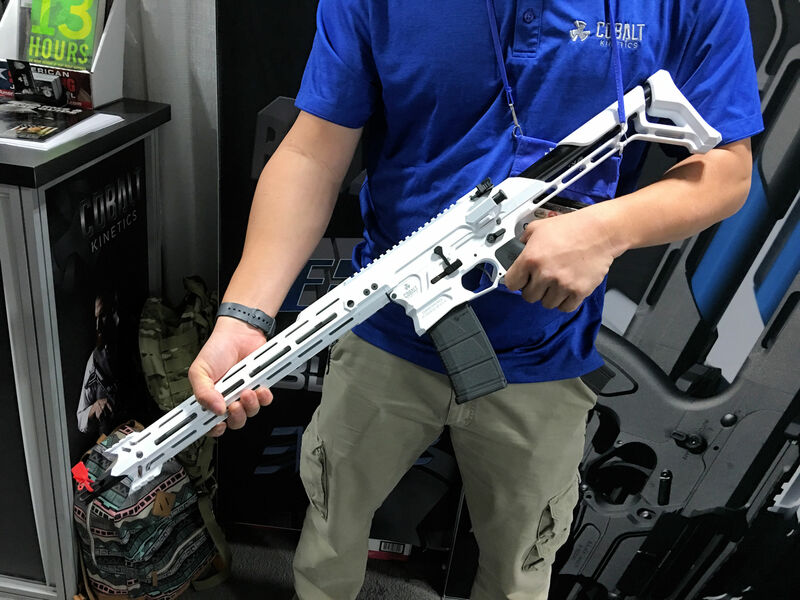 Well, there’s a new BAMF model AR that DR got to see at SHOT Show 2017 called the Cobalt Kinetics BAMF EDGE that’s about $300 more expensive than the standard BAMF model, although DR wasn’t told why. We’ll try to find out. 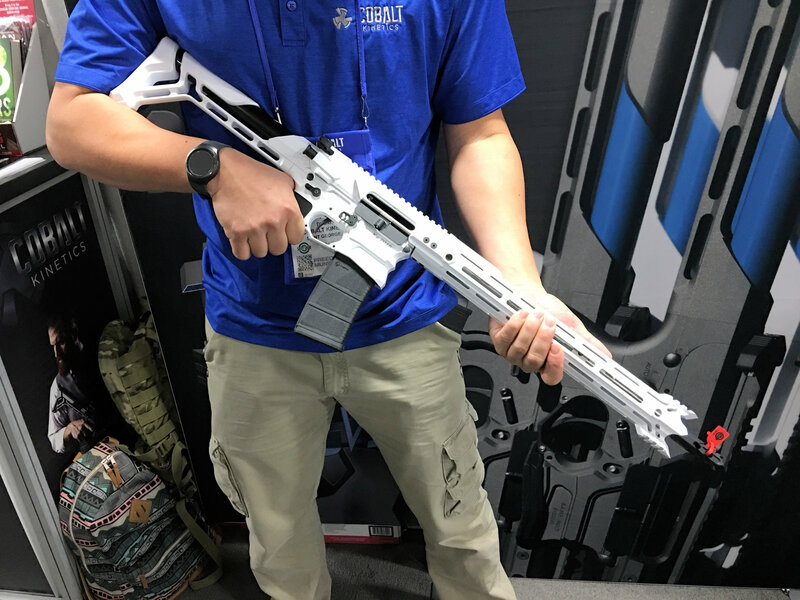 In the meantime, we just learned that all Cobalt Kinetics AR rifle/carbines can now be purchased with Cobalt’s patented Cobalt Advantage Reload System (CARS) as an option, which could potentially make the BAMF and BAMF EDGE even faster to operate than the Cobalt Kinetics Evolve AR (particularly for left-handed shooters), since the shooter can have both the DUAL DROP AND CARS systems in one gun. We’ll ask Cobalt Kinetics about this, too. By the way, Defense Review will also try to find out when the new Cobalt Kinetics AR Rifle Round Counter (shot counter) will be available for purchase, so you can have one on your EVOLVE, BAMF or BAMF EDGE. Editor’s Note: DR would be very interested in seeing some select-fire full-auto SBR (Short Barreled Rifle)/PDW variants of the Cobalt Kinetics BAMF and BAMF EDGE equipped with the Cobalt Kinetics CARS and AR Rifle Round Counter systems, the Geissele HSS (High Speed Selector), CARS-adapted FERFRANS Inc. DSAS/RSS (Delayed Sear Activation System)/Rate Reduction System BCG (Bolt Carrier Group), and either an Operators Suppressor Systems/OSS Mission or Arsenal Firearms AF Streamer QD556-A and QD762-A QA/QD low-back-pressure silencer/sound suppressor (the latter was designed and developed by Finnish company Saimaa Still Oy, btw). Now, THOSE would be some interesting little weapons packages! In the meantime, enjoy our video below, from SHOT Show. Next: Defense Strategies Institute (DSI) 6th Annual Military Tactical Communications Summit (September 12-13, 2017): Taking 21st-Century Military Tactical Comms to the Next Level!